Among Filipinos, Juan Luna's "The Spoliarium" must be the most well-known painting by a Filipino artist because of its historical significance. "Rizal interpreted the Spoliarium as a symbol of 'our social, moral, and political life: humanity unredeemed, reason and aspiration in open fight with prejudice, fanaticism, and injustice."" Historical Significance. Juan Luna had already gained a certain degree of reputation as an artist in the Philippines before his trip to Europe in 1877 to further his studies. While in Madrid, one of his mentors recognized his talent, and invited Luna to work with him in Rome. This interlude in Rome also allowed Luna to study the works of the "Renaissance Masters", as well as the works of other well-known painters, including the Dutch painter Rembrandt va Rijn. The reputation of Luna as an artist in Europe begun to be established during his exhibition at the first in 1878 at the first art exposition in Madrid, the Exposición Nacional de Bellas Artes (National Demonstration of Beautiful Arts). His entry, " La Muerte de Cleopatra (The Death of Cleopatra)" in won the silver medal in the 1881 exposition. His increasing reputation as an artist also earned him a "pension" from the Ayuntamiento in the Philippines. In May 1884, he submitted the painting that would become known as "The Spoliarium" to the Exposición Nacional de Bellas Artes, and won the gold medal. Another entry by a Filipino artist Félix Resurrección Hidalgo. won the silver medal in the same exposition. "The largest work, the most frightful, the most discussed work of the Exposition." "It is more than a painting, it is a book, a poem." "It is something more than the mere mechanism of genius, of the art composition. . . Luna is a thinker." "The superior qualities of Luna are: as an artist, his ambition to produce great designs; to subdue the multitude with the resources of the highest class in art; serious and rough, not with vile adulations from the pencil nor of color in beautiful lines; as a painter, his energetic style, broad and noble, truthful and on occasion fantastic." "A giant of art, a kind of Hercules, that enters furiously leveling down all the gods with blows from his club, bringing in a new art, full of ideas and forms, carrying a Spartan soul and the brush of Michelangelo. More than sixty years did Michelangelo study! How many years did Luna study? Six! Let us wait." During the celebration in June 1884 to honor the double win of the Filipino artists, "Rizal interpreted the Spoliarium as a symbol of 'our social, moral, and political life: humanity unredeemed, reason and aspiration in open fight with prejudice, fanaticism, and injustice."" The double win by the two Filipino artists in the same exposition in 1884 was one of the highlights of the Filipino propaganda movement in Europe during the latter part of the 19th century. Among the Filipino intelligentsia in Europe at the time included Jose Rizal, Marcelo H. del Pilar, Lopez-Jaena as leaders. One of the goals of the Filipino intelligentsia reform movement was clamor for reforms from the Spanish government, and participation of Filipinos in the government of the Philippines. Integral to their goals, the Filipino intelligentsia reform movement also wanted to change the perspective of the Spanish colonizers in relation to how they view Filipinos. Even as late as mid to late 19th Century, the Spanish colonizers considered Filipinos as indolent, savages and not yet ready to govern themselves. These charges prompted Rizal to write in defense about "The Indolence of the Filipino People". Display Location. In 1887, the Diputación Provincial de Barcelona bought the Spoliarium for 20,000 pesetas quite an enormous amount at the time. In 1951, the Spanish goverment gave the Spoliarium as a gift to the Filipino people. The Spoliarium resided for years in the Department of Foreign Affairs in Manila. It is now displayed in the main gallery (ground floor) of the National Museum of the Philippines, the first work of art that would be most prominent to visitors of the gallery in the National Museum. 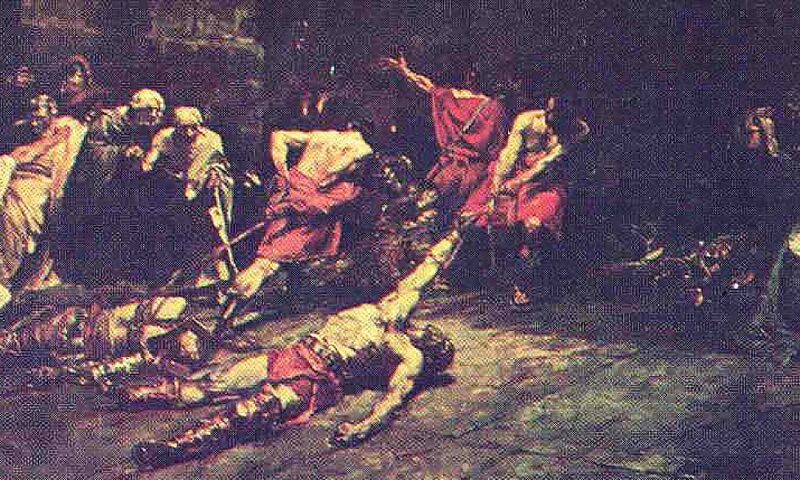 The Spoliarium (often misspelled Spolarium) is a painting by Filipino artist Juan Luna. The painting was submitted by Luna to the Exposición Nacional de Bellas Artes in 1884, where it garnered a gold medal. In 1886, it was sold to the Diputación Provincial de Barcelona for 20,000 pesetas. It currently hangs in the main gallery at the ground floor of the National Museum of the Philippines, and is the first work of art that greets visitors upon entry into the museum. The spolarium measures four meters in height and seven meters in width. 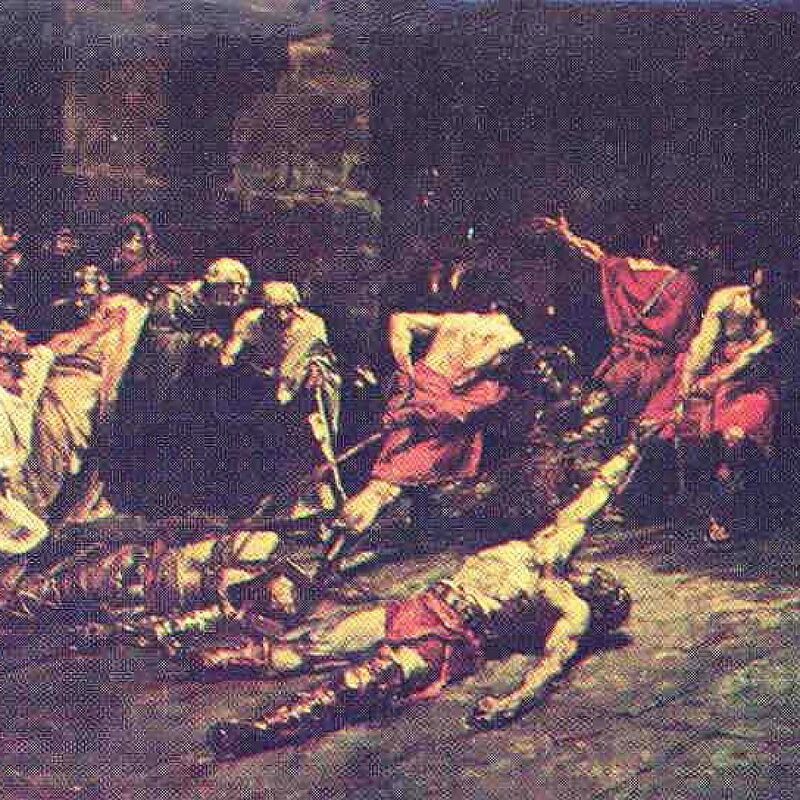 The canvas depicts a chamber beneath a Roman arena, where bodies of dead gladiators are being dragged into a shadowy area, presumably to be piled for disposal. Spoliarium was painted on a very large canvas and is more or less life size. It depicts defeated gladiators in the arena being dragged into a pile of other corpses. On the left side, there are spectators viewing the spectacle with a variety of expressions, while on the far right side of the painting is a grieving woman in torn and shabby clothing. Horizontal lines are seen in the walls and the people watching the scene. But diagonal lines that denote movement are very obvious and can be seen in the gladiators’ slain bodies, in the men dragging them and in the floor tiles. There is dominant use of contour lines as shown in the muscles of the arms, legs and backs of the gladiators. In the use of color, there is a governing use of red, mostly seen in the center, that is one of the first things to attract the attention of the viewer. The use of blue on the weeping lady's dress creates contrast against the gladiators’ red dresses. The intensity of the color red is very overwhelming. Almost all of the colors used are warm colors, which is thought to be intentional on the part of the artist. Luna has been known to use colors not simply for reasons of aesthetics but also for their symbolic value. The Spoliarium shows the Spanish government's mistreatment of the Philippines. 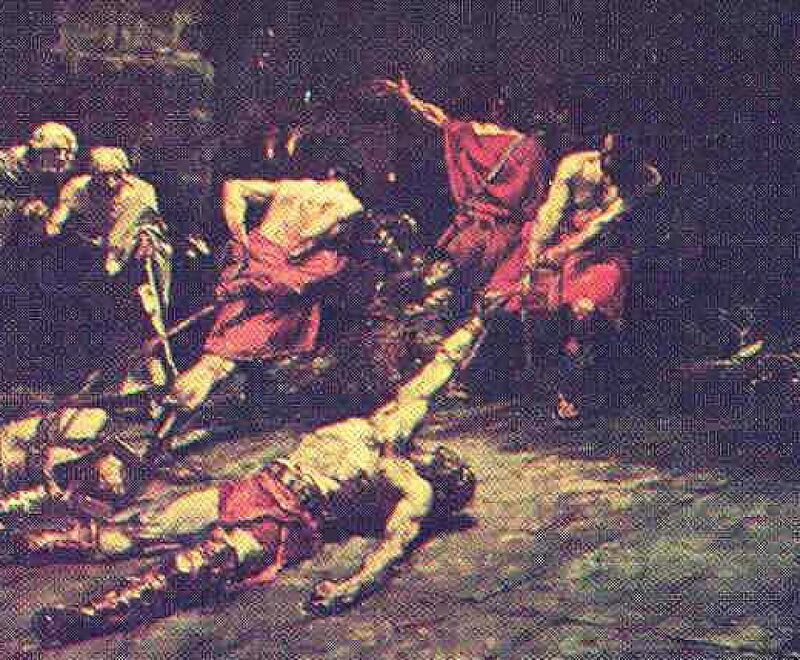 The dead bodies of the gladiators represent the Spanish killings of Filipino revolutionaries. Ryan Cayabyab composed the opera Spoliarium, which chronicles the creation of the eponymous painting and Juan Luna's trial for the murder of his wife. Soprano Fides Cuyugan-Asensio wrote the libretto. A recorded version was released for commercial distribution in 2006. Filipino alternative rock group The Eraserheads' album Sticker Happy contained a track named Spoliarium. Ocampo, Ambeth R. "Juan Luna's Works." Philippine Daily Inquirer, 24 October 2007. Sevilla, José N. Sa Langit ng Bayang Pilipinas. Mga Dakilang Pilpino o Ang Kaibigan ng mga Nag-aaral. Manila: Limbagan nina Sevilla at mga kapatid at Kn., 1922. The quotes in italics were from the lecture by Eric Torres,"The Art of Juan Luna" to commemorate the the 110th birth anniversary of Juan Luna on on 24 October 1967.